He was an important man. He was a teacher of the Jewish people, and he was supposed to know everything about the ways of God. "Teacher, what must I do to be saved?" There was something about Jesus, something about the way he looked into your eyes that said, "I know." "Unless a man is born again, he cannot enter the Kingdom of God!" was all that Jesus said. "But, Master, I am old! How can I be born again? Am I supposed to crawl back into mother's stomach and be born again? I don't think it will work!" But Jesus smiled warmly. "I tell you, unless you are born of water and the spirit, you cannot enter the Kingdom of God." Nicodemus left Jesus that night, still very much in the dark. The old, tired, and very confused Nicodemus crawled into bed that night, saying over and over to himself, "Unless you are born again, you cannot enter the kingdom of God...Unless you are born again..."
And then he had a dream. He was a young boy again, and a package arrived at the door. "To Nicodemus. Try not to get it dirty." Well, Nicodemus TRIED to open the package carefully, but in the end, he couldn't help it. He tore it open. Inside was the most beautiful robe he had ever seen. It was dazzling white with brightly colored stripes at the bottom and the ends of the sleeves, in designs that seemed to have been hand stitched especially for him - amazing designs of all the things he really liked; lions and dragons and bowls of fresh figs with cheese. It was a robe obviously made with incredible love. He put it on right away. Everyone in his little town had gotten one, and that next day, they all looked so magnificent. Of course, Nicodemus wore his everywhere. He TRIED to keep it clean. He really did. But then he got into a fight with his little brother one day, and got a grass stain on the knee that just wouldn't come out no matter how hard he tried to wash it. And one day he lied to his mother about where he was going, and the next morning his robe didn't seem quite as bright as it did before. He cheated on a test once - just one answer, honest! but the next day the designs on his sleeves seemed a little duller. And then he stole that biscuit from his little sister - the one she had been saving for after school - and a bit of jam spilled on the front of his robe, and there was another stain that wouldn't go away. Still, he tried to keep his robe clean as best he could. Not everyone did. Some didn't care how dirty or torn or tattered their robes got, as long as they were having fun. It didn't matter to them at all if they were ruining an incredible gift. And then one day many years later there was another note on the door. "The King is Having a Feast. At the sound of the trumpet, all will come." Now, the King's palace was deep in the woods, and no one from Nicodemus's little village had ever been there before. There were stories of music and dancing, and laughing all night long, until you could hardly stand up. There were stories of food piled so high on great long tables that there was hardly anywhere left to eat. And tall, crystal glasses filled with sweet drinks that tingled your toes but never rotted your teeth no matter how much you drank (or gave you a stomach ache either!). And there was a great fireplace. Every night by the flickering light of the fire, the King would tell stories like no one had ever heard before - amazing stories, and they always seemed to be just about you. And the endings were always just perfect, better than you could ever dream up yourself. Well, at last the day came. A trumpet was heard off in the distance. But what do you wear to the King's palace? Your absolutely finest, of course. And for everyone in this poor village, that was the robe they each had received all those years before. Only some of those robes weren't so fine anymore. Some were worse than others - some MUCH worse. Some people were ashamed at how shabby their robes had become, and dreaded the thought of having to appear before the King in practically rags. Some others didn't care, just as long as there was free food. But Nicodemus had kept his robe cleaner than most. He tried his best. Still, somehow it didn't seem to be enough. The next morning, a path into the woods appeared. Everyone was sure there hadn't been one there before. And as the crowds pushed along it, foxes and squirrels and deer seemed to leap along beside them. When they all arrived at the palace, they found that it was surrounded by a great wall made of the purest, whitest stone they had ever seen. They crowded and pushed their way along the road that led up to the main gate - a magnificent gate, as high as twelve men, made entirely of gold. But then, an astounding thing happened. There was a poor beggar, in tattered rags, sitting near the gate. "I am the King's son, listen to me!" the man said. "The King loves you all so dearly, and his greatest desire is for you to come to his feast. But only those who are properly dressed can ever enter the King's palace. And look at you! But yet there is a way. Believe in me! Come in by me!" Now, some people didn't take too kindly to the idea that their finest robes weren't worthy of the king, and so they began to make fun of the poor beggar man. "Ha!" they said, "And look at the rags you are wearing!" And they began to tease him and mock him... and then they spit on him, "There, that will help you clean your rags!" they said. The truth was, while the beggar's robes were torn and muddied, it didn't seem to be of his own doing - and somehow, their robes seemed all the shabbier in comparison. They felt ashamed in his presence somehow, and they didn't like it. They didn't like it all. Finally they had enough of this trouble-maker ruining their special day - he was the problem, after all, not them - and so they began to push and shove him. They wanted to remove him from their sight for good. Things got uglier and uglier, the crowd became angrier and angrier, until at last, they carried the beggar off and beat him to death. Then one by one they came to the palace door. As each one entered, the heavy gold door thundered shut behind them. Time passed, and Nicodemus could hear the sound of crying somewhere off in the distance. Well, at last it was Nicodemus's turn to step through the door. He stepped through the entryway and the heavy door closed behind him. What Nicodemus saw now I can't say - because there are no words to describe it! But it was more glorious, more brilliant, more splendiferous than all the stories he had ever heard. And then he looked down at the robe he was wearing... and he knew at once it didn't belong in a place as perfect as this. Off to his left he saw the wealthy man who had entered just before him. His robe had looked even more carefully kept than his own before they had entered, but now, in the glorious light of the palace, it looked so shabby and dirty. The poor owner was shown to a small door and let out. And as the door opened, Nicodemus could hear then that this was where the crying was coming from. It was the cry of all those souls who had seen what they could have had, but were found not worthy. They all had been invited to the feast, but they could not be a part of it. Nicodemus waited for his turn to be escorted out. But then to his complete amazement, the young beggar appeared. His robe was torn and bloody - but he was very much alive! "You do believe in me," the beggar said, as his eyes looked straight into Nicodemus's heart. There was a basin on the floor, and the beggar took off his robe and squeezed some of the blood into the water in the basin. Then he dipped his robe into it, until you could see nothing but the water mixed with blood. The beggar took the robe from basin - and it was white as snow! It was so bright and spotless it hurt Nicodemus's eyes to look at it. And even more than that, the man had changed. He was no longer a beaten and bloody beggar. He was now standing there tall and magnificent. Truly he WAS the King's own son! 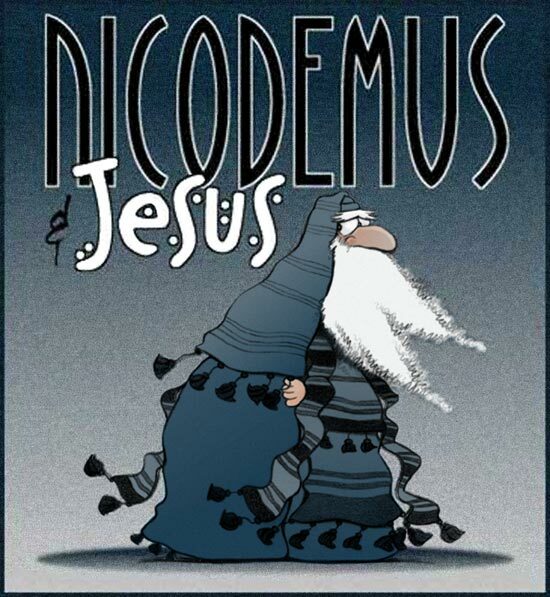 "My dear Nicodemus! Did you not know that my father built this house out of love for you?" "Here," the King's son said to Nicodemus, "Put on my robe, washed in my blood. Now you are worthy to enter my Father's Feast." Nicodemus awoke from his dream. Now he understood what Jesus had said. Believe in Jesus, and you will be made brand new, you will be born again. Therefore, if anyone is in Christ, he is a new creation; the old has gone, the new has come! All this is from God, who reconciled us to himself through Christ. Then one of the elders asked me, "These in white robes --who are they, and where did they come from?" they shall be white as snow." But now the righteousness from God has been made known. It is the righteousness from God that comes through faith in Jesus Christ to all who believe. We all have sinned and fall short of the glory of God. But we are made right again by God's grace. We are redeemed by Christ Jesus. For God presented Jesus as a sacrifice for our sins. By our faith in his blood, He became our sacrifice. He did this to prove that he is just. In his great patience he let sin go unpunished because of his love for us. But now justice has come, and the rightful price for sin has been paid by the death of Jesus on the cross, and we who believe in him have been put right with God through our faith in Jesus. For God so loved the world, that he gave his only son, that whoever believes in him should not perish, but have eternal life.